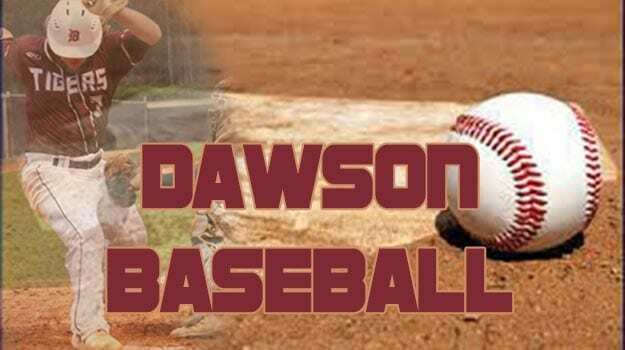 The Tigers of Dawson County hosted the Trojans of North Hall in Game 2 of the three game region series on Wednesday at the home of the Tigers. Dawson put one run up on the board on six hits in the game with 9 strikeouts. The Trojan hurler went all seven getting the complete game victory in a dominating performance. The Tiger were held scoreless until the third. Palmer Sapp, 3-4 on the day, stepped to the plate with 2 outs and down by six to the Trojans. On a 1 ball and no strike count, Sapp took the North hall pithcer deep over the center field fence for a solo homerun for the only run in the game for Dawson. Only three other Tigers would reach base by hit. Hudson Sapp(1-2), Nathan Sorrells(1-3) and Hunter Barron added one hit each for Dawson. Defensively for the Tigers, Palmer Sapp, Nathan Sorrells and Cameron Moore to the hill and in 7 innings the three combined for 16 hits, 10 runs all earned, 4 walks and had 8 strikeouts. Dawson played solid defense behind their hurlers committing only 1 error on the day. In the 10-1 win for the region champion Trojans, 6 runs in the third, 1 in the fourth, 2 in the sixth and 1 in the seventh. In the field, the Trojans committed no errors. Next up for the Tigers will be a trip to North Hall on Friday to face the Trojans in game three of the series and last game of the regular season. Game time is set for 5:55 P.M.
Next Article » Senator David Perdue: "Mike Pompeo Is The Right Person For The Job"